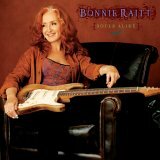 Throughout her 34-year career, Bonnie Raitt has released a mixed bag of albums that far too frequently have failed to utilize the full scope of her talent, and at their worst, they featured song selections that were uninspired and guitar playing that was overly constrained. Her slew of Grammy victories and the accompanying commercial success only exacerbated the problem by causing her to approach her craft from a more conservative and increasingly formulaic perspective. Her 2000 endeavor Fundamental was an attempt to break the mold and get back to her roots, but the production of Mitchell Froom and Tchad Blake partially obscured the organic ambience that she was attempting to embrace. Her most recent effort Souls Alike, however, is something entirely different, and it’s safe to say that it’s the best outing that Raitt has crafted in years. Although Blake lends a helping hand on Souls Alike, Raitt serves as the outing’s primary producer, and in doing so, she succeeds in applying his experimental tendencies only where they are most needed. As a result, she is able to bridge the gap that typically has divided her infatuations with both edgy blues and pop-driven soul. Strangely enough, the album begins in an uninteresting fashion with the generic roots-rock of I Will Not Be Broken. Written by the same team (Gordon Kennedy, Wayne Kirkpatrick, and Tommy Sims) that penned Change the World for Eric Clapton, the tune serves as a safety net in that it’s designed for (and achieves) widespread, crossover appeal, and not surprisingly, it immediately was proffered to radio as the collection’s first single. Equally problematic is the concluding The Bed I Made, which wants to be a transcendent torch song but sounds exceedingly dull, despite its unsettling lyrics. Souls Alike is available from Barnes & Noble.